Here’s something interesting that I accidentally stumbled upon whilst trying to find some info. on an upcoming new vintage diver from Zeno. 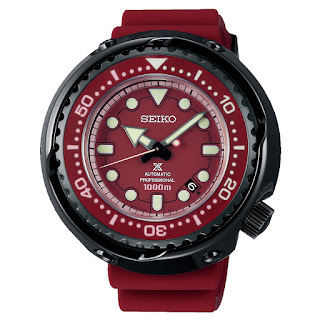 This is a 2017 or perhaps slightly earlier release that hadn’t appeared on my radar until now as Zeno as brand for whatever reason has never really been one that I follow. 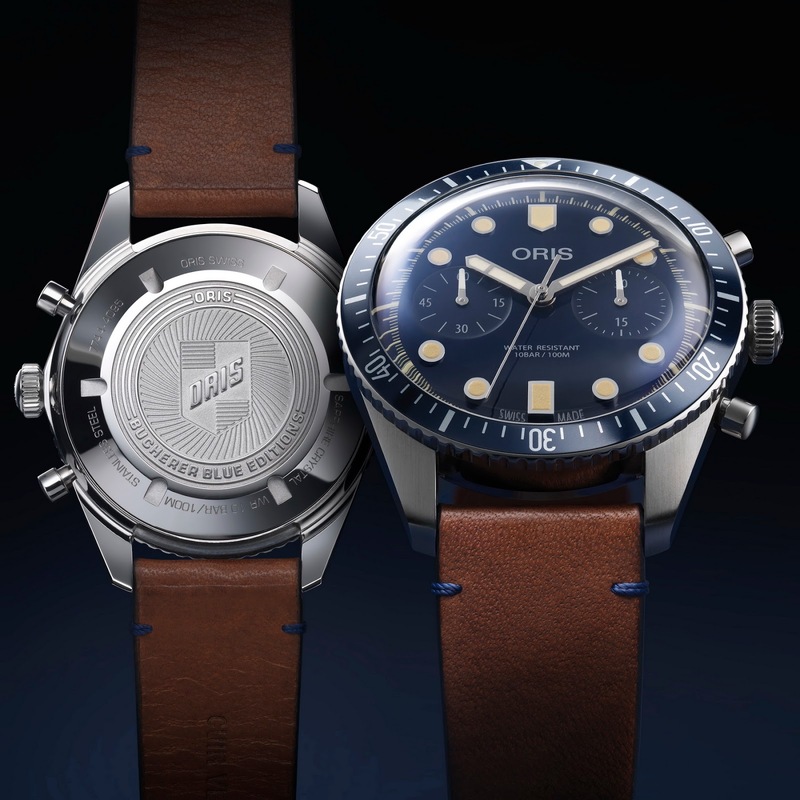 The Zeno Navy Diver Retro forms two parts of a collection of 6 dive watches that are based on an historic model – 4 Army Divers and these 2 Navy Divers. 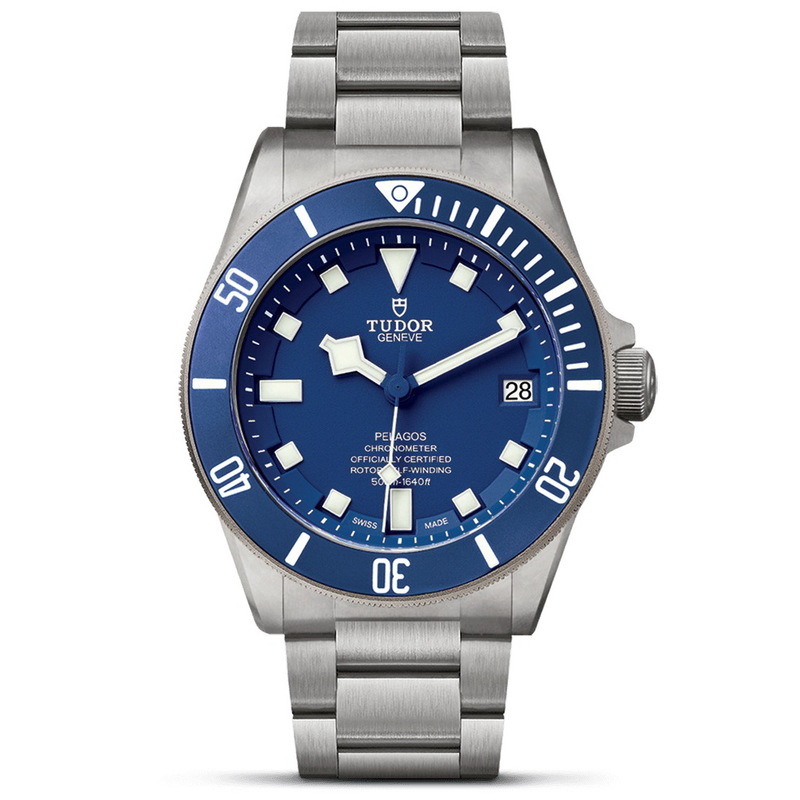 I’m not the dive watch design police, so am in no position to cry foul but the similarities between this and a Doxa Sub are not lost on me. 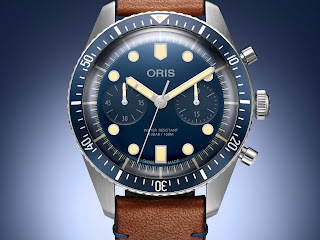 The bezel with its dual markings: no decompression (inner) and dive-time (outer) rings are said to be taken from an original design from 1970. Not sure whose though (insert head scratch)? 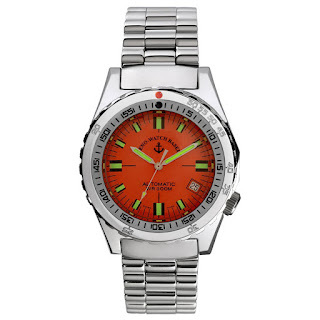 I have always viewed the dual diving-scales as a well-known Doxa trademark, so do they really belong on this watch? BTW earlier iterations of the Zeno Navy Diver Retro even used orange for their no decompression markings! Those bezel teeth are pretty damn similar, too. 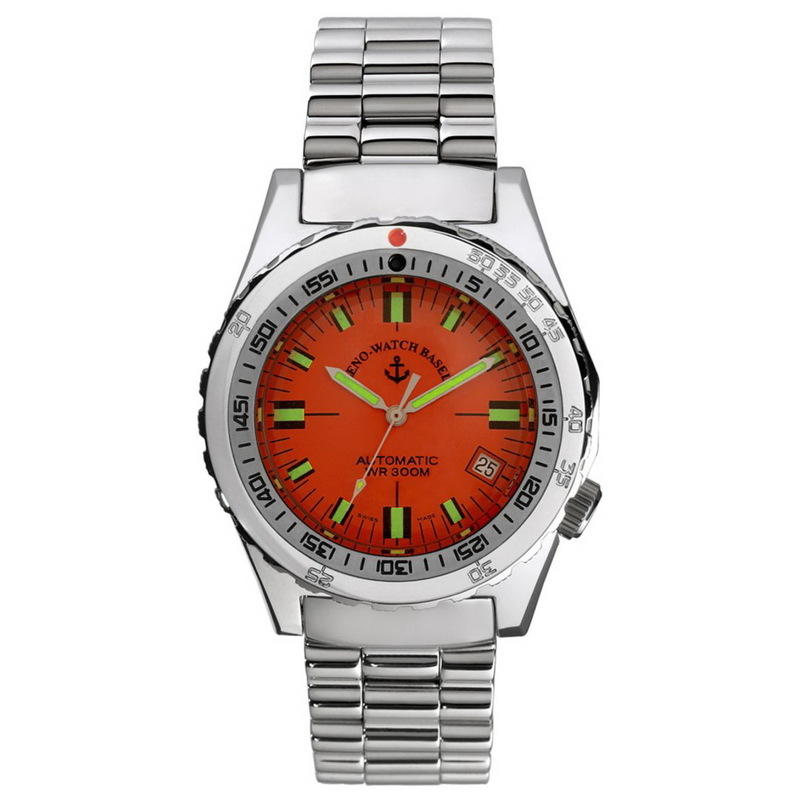 The dial of the orange variant is pretty much identical to a Doxa Sub 250 safe for the awkward looking hands set which looks wrong compared to say, a set of black sword hands. 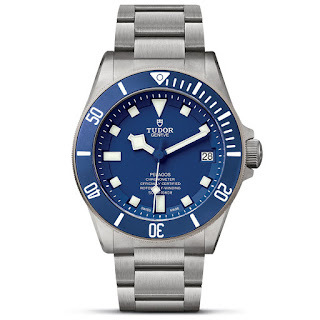 Besides the similarities to Doxa, the Navy Diver Retro looks okay. Actually imho, it probably owes any good looks it may or may not have to those borrowed elements. Anyway, here’s the spec. for this controversial diver from Zeno Watch Basel: a 40mm Stainless steel case with 300m of water-resistance, an ETA 2824 auto and an acrylic crystal. 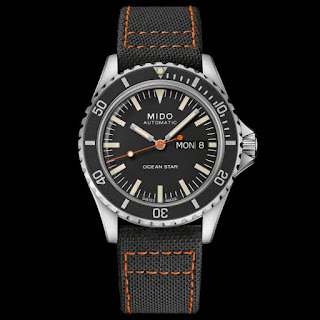 Swiss MSRP BTW is 698CHF which is a hundred Swiss Francs more than the other 4 variants that don’t use Doxa design elements. Thoughts? 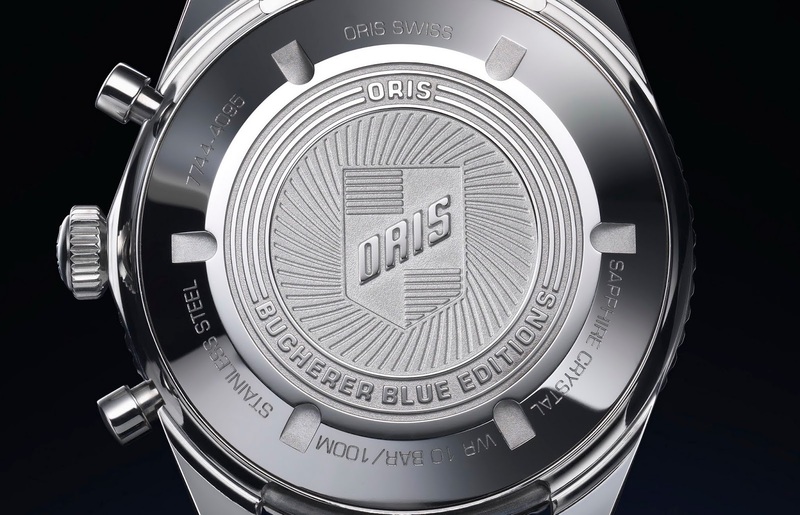 My initial thoughts are; this is cheeky as f#ck but it’s not really my business and perhaps some might see this as a more affordable Doxa from an otherwise bonafide Swiss watch company. Final thoughts, though – still cheeky as f#ck (imho, that is)! 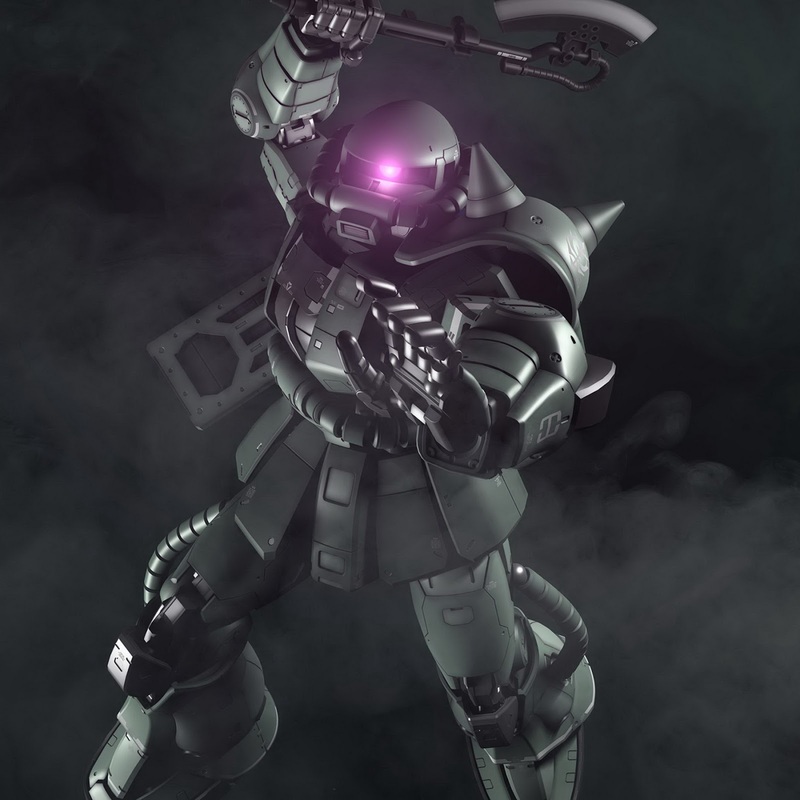 What do you think? Scurfa has a new Diver One and it’s yellow! Introducing the new Diver One D1-500, a true offshore dive watch born from an accumulation of 7 years of on-the-job wear and experience in extreme commercial diving environments. 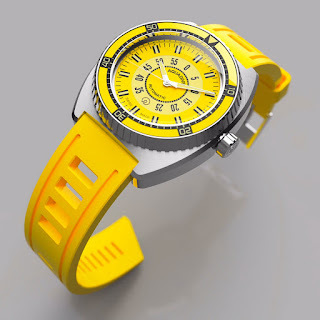 This is the new Diver One D1-500 from the UK’s Scurfa Watches with its highly visible dial in bright matte yellow. The Diver One is based on a tough anti-corrosion-resistant 316L Surgical Grade Stainless steel case measuring a modest 40mm in diameter by 14.4mm thick. a solid 316L Stainless steel case-back with a 1mm gasket, a 7mm screw-down crown with quadruple gaskets and D-1 signed logo. 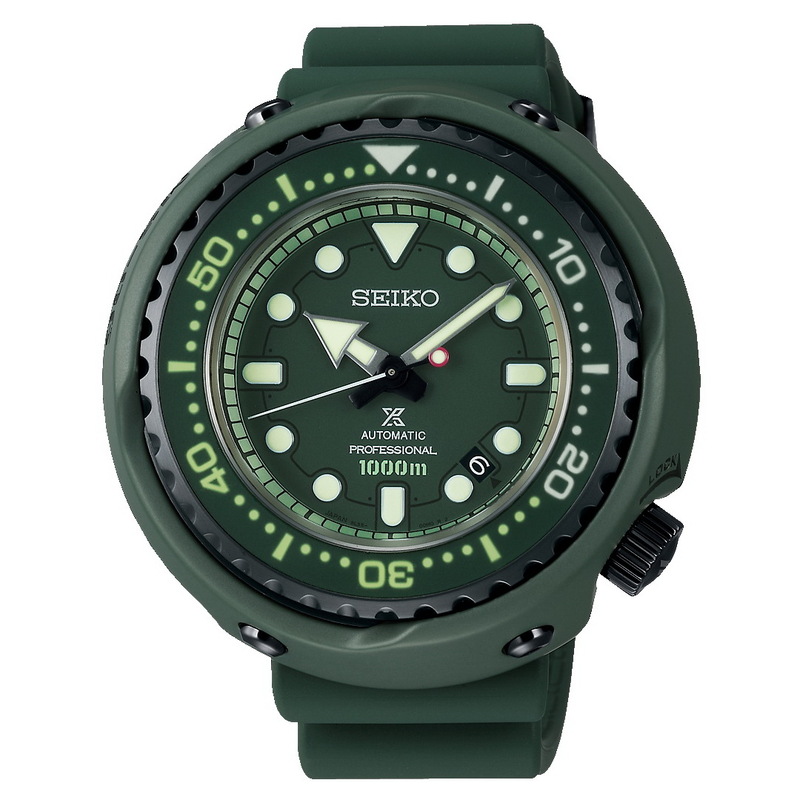 Further diver’s features include: a 120 click unidirectional bezel with; aluminum insert plus dive-time scale and luminous 12hr pip. 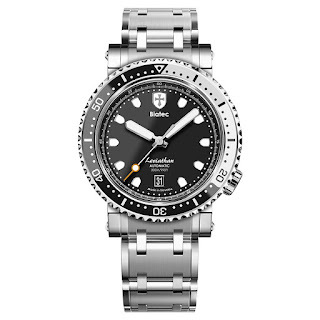 The Diver One is a watch that has been designed by commercial offshore divers for use by commercial offshore divers and as such is fitted with a Heliox Escape Valve. This has been tested by Paul of Scurfa at different depths and on different gas mixtures and at a deepest decompression of 154 meters to the surface. The watch’s matte yellow dial has been thoughtfully paired with a set of gloss black hands for maximum contrast and visibility. All hands, dial markers incl. the bezel pip are with Grade A Swiss BGW9 SLN which emits a bright blue glow. 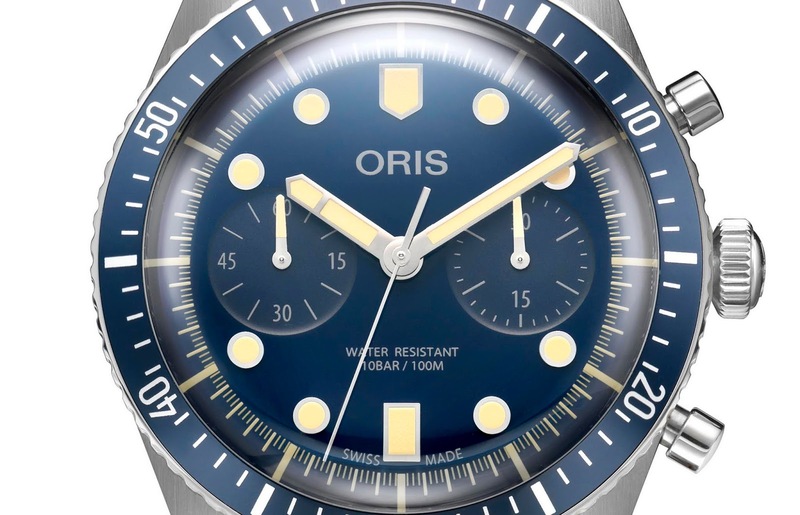 The dial is covered by a domed Sapphire crystal with a blue Anti Reflective coating on its underside. Powering the Diver One is a Swiss Ronda 715SM Gold plated 5 Jewel Quart movement with longer battery life and a EOL indicator. It comes on a Scurfa black rubber diver’s trap based on the type of Italian leather straps seen many vintage dive watches today. The strap is secured to the case via drilled through lugs with strong single shoulder spring bars (20mm X 2mm X 1.2mm). The Diver One D1-500 comes with a 12 months warranty and is supplied in a German manufactured Twist Box of the same type used to supply a range of spare parts to the diving and offshore industry. 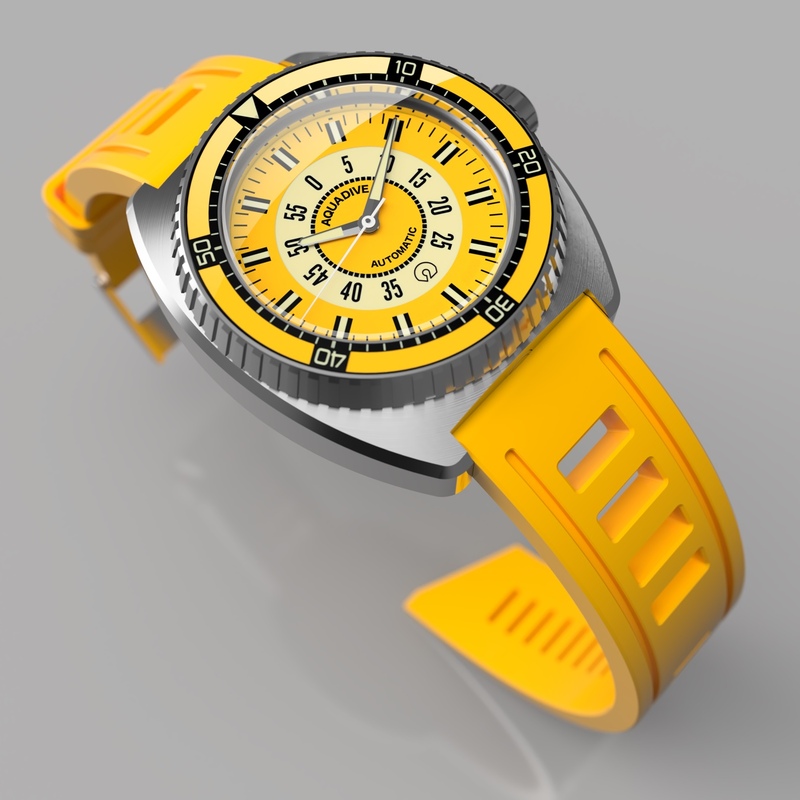 Follow the link embedded, below to order your Diver One D1-500 Yellow. 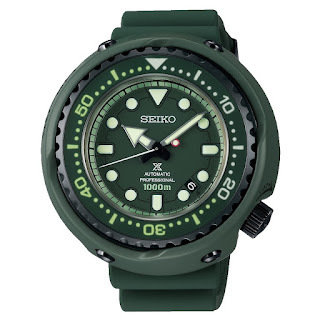 Here’s a Slovakian dive watch; HALDOR aside there aren’t too dive watches coming out of Central Europe. 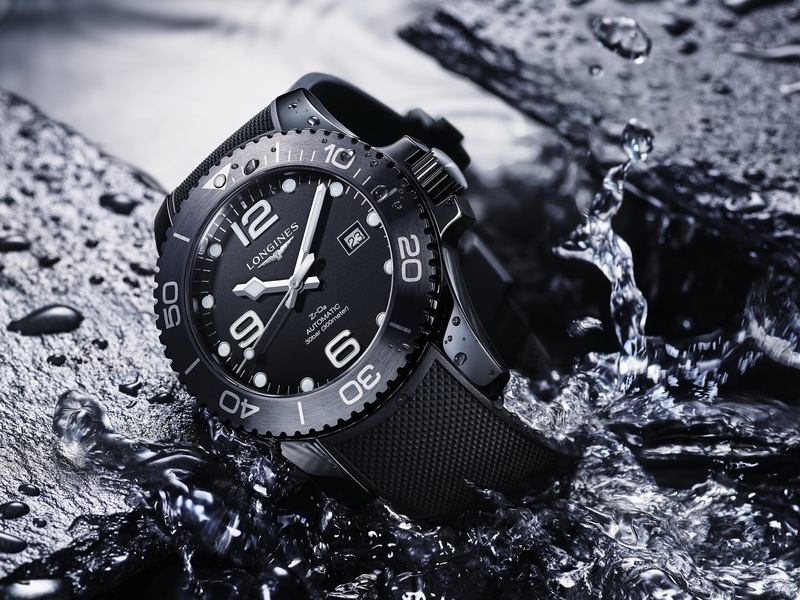 Biatec have just released their debut diver, the Leviathan with NanTec technology, a proprietary combination of case hardened high grade Stainless Steel with a NanTec finish which provides up to 600 Vickers of Hardness. It has a 40mm Stainless steel case which is fitted with a diver’s bezel with a Sapphire inlay, has 300 meters of water-resistance and is home to a Swiss automatic movement with 26 jewels, the Sellita SW200 Premium. 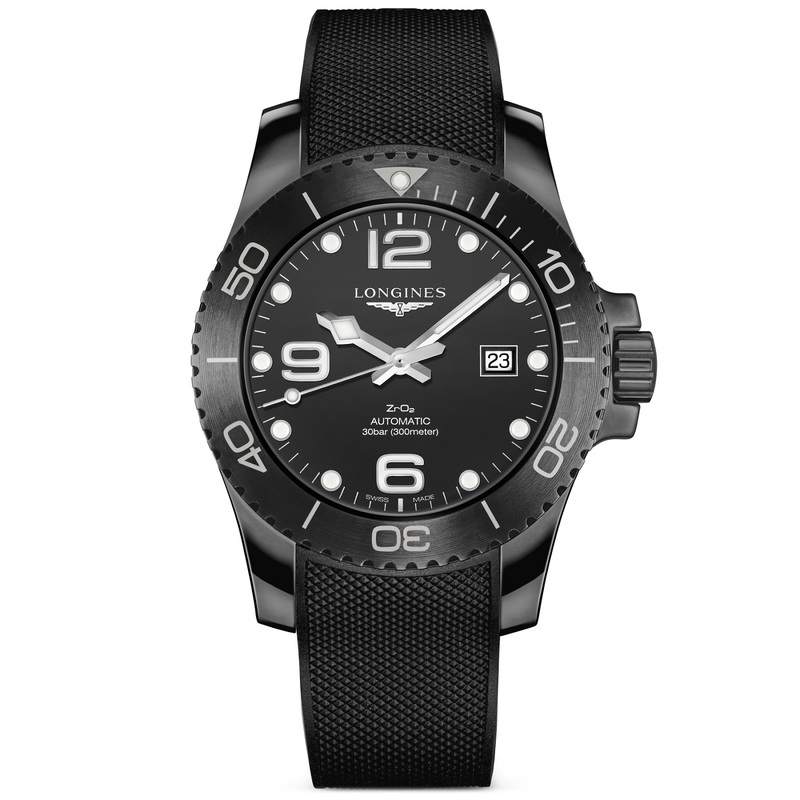 The Leviathan comes on Stainless steel bracelet also with NanTec technology and butterfly clasp. 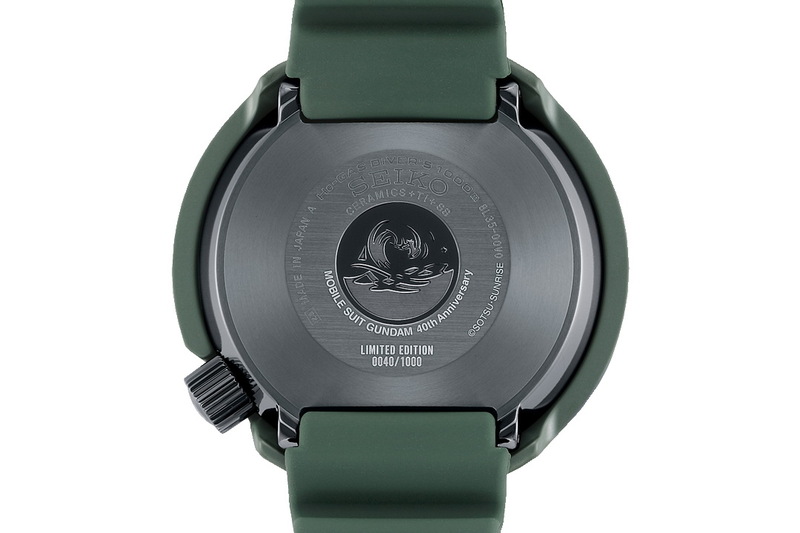 It comes in three dial colors: black, blue or black with old radium accents. 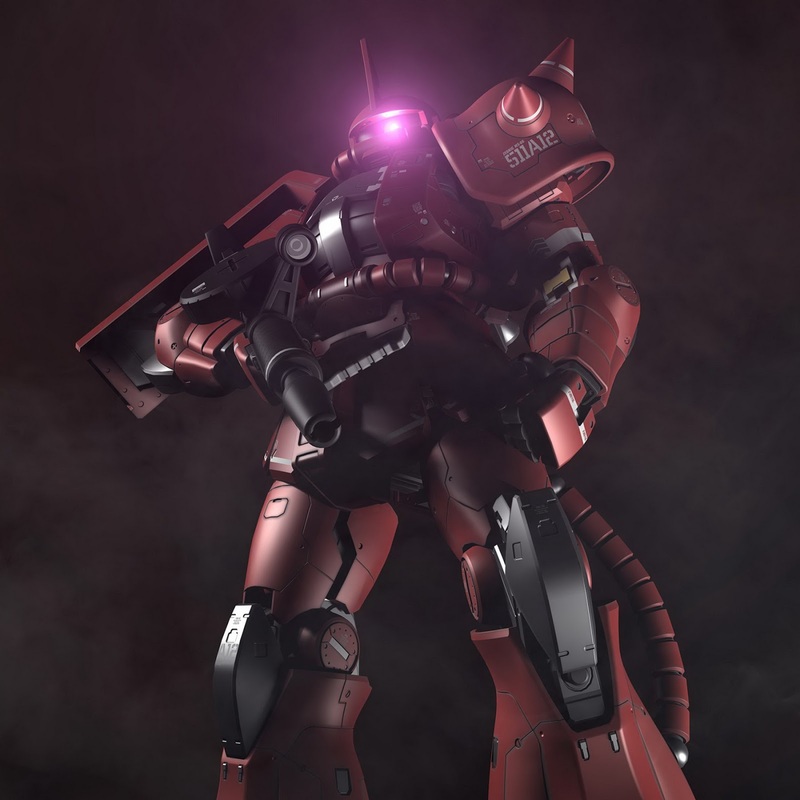 Its pre-order price is 850 €. Availability is this Summer. Thoughts? 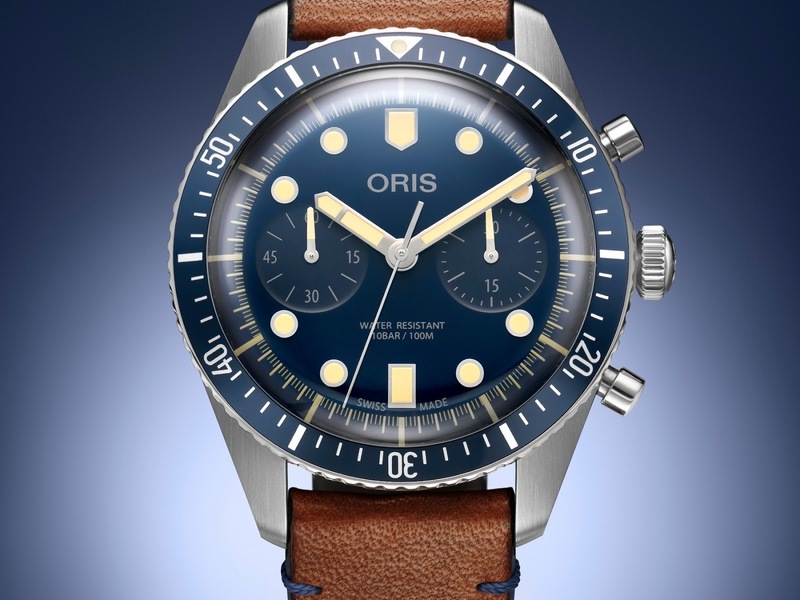 Looks nice but that bezel inlay has certainly done the rounds. Mido have an Ocean Star Special Edition watch coming out very soon! The Ocean Star Tribute is a (sort of) retro inspired diver that uses some vintage design elements to create a new vintage-style Ocean Star. Nothing has been officially released but here are a few basic specs. for the moment. The Ocean Star Tribute looks like a regular Ocean Star but for some tweaks. 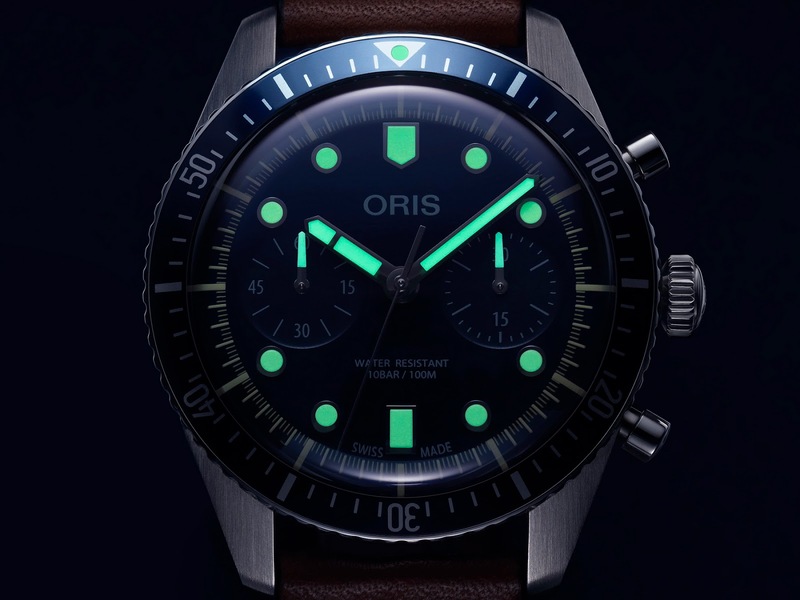 It gets a 40.5mm Stainless steel case with 200m of water-resistance and divers bezel with (new) 50-min dive time scale (new) triangular 12hr marker with luminous pip. 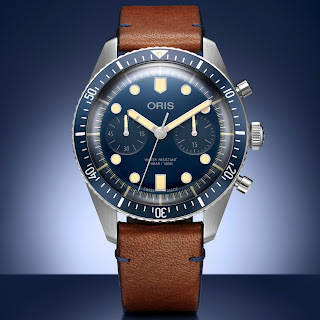 The case is fitted with either: a vintage-style multi-link bracelet and / or a fabric strap in blue with white stitching or black with orange stitching. 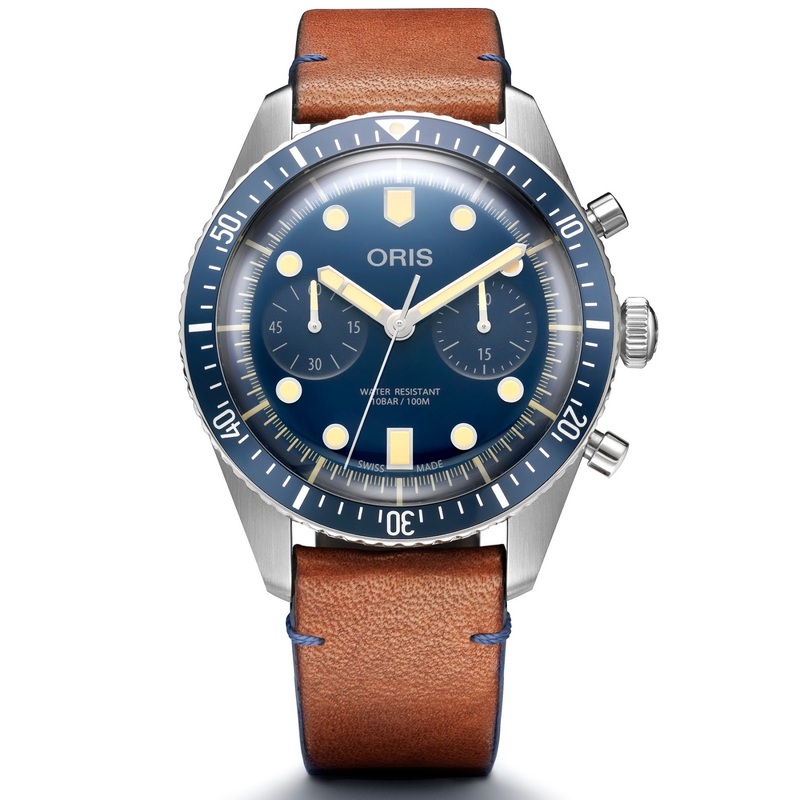 The more vintage aspects of the watch however appear on the dial: minimal text, an orange lollipop sweep seconds hand, baton hands and markers and matchstick minutes. Sadly the Ocean Star’s massive day / date display remains. Going by the video, the Tribute also gets a vintage domed Sapphire crystal. Thoughts? Seems perhaps a little half-arsed to me but it does look a lot better than the reg. Ocean Star. Introducing the new Seiko Prospex Diver 1000M made in celebration of Mobile Suit Gundam's 40th Anniversary! Yes, something very cool that Seiko Prospex nerds, fans of Japanese anime / manga and hypebeasts in general can collectively geek out over. If that’s you - arm yourselves with some clean undies, plenty of tissues and a brown paper bag; I anticipate some possible pants wetting, much drooling and a little hyperventilation will ensue. These are the Seiko Prospex Professional Divers 1000M x Mobile Suit Gundam 40th Anniversary watches AKA The Gundam Tunas ref. SBDX027 (green) and SBDX029 (red). 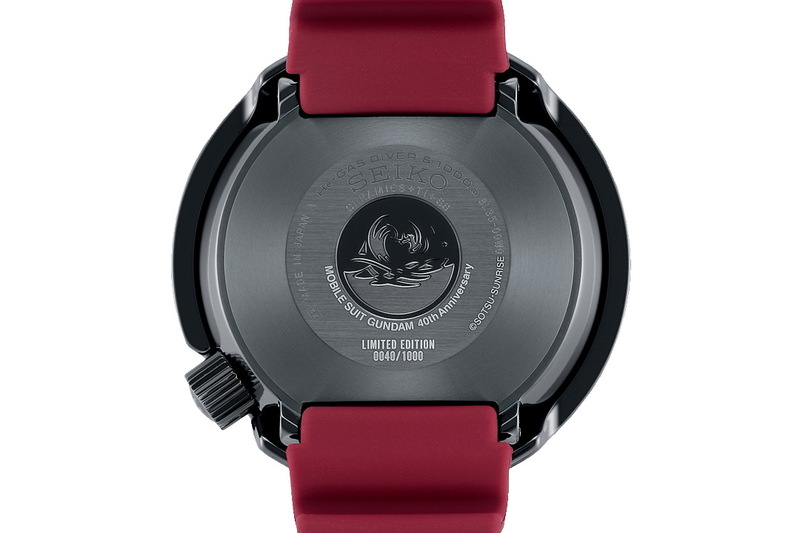 SBDX029 with its blood dial and strap and gloss black shrouding. 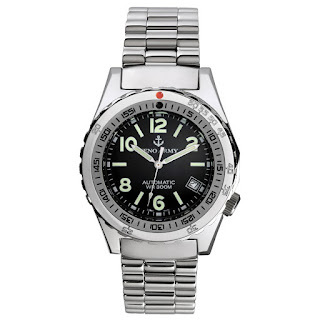 Both watches get contrasting black steel case components. 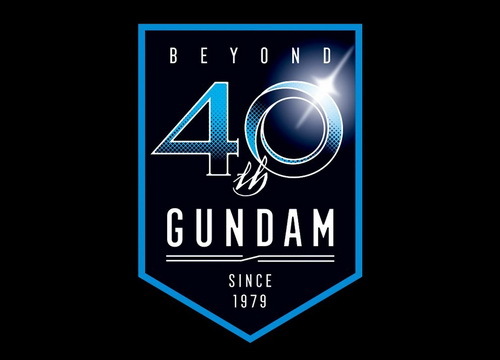 color-coded rubber driver’s straps with printed logos, case-backs with LE# / 1000 pieces (of each) plus special “MOBILE SUIT GUNDAM 40th Anniversary” engraving. Basic spec. 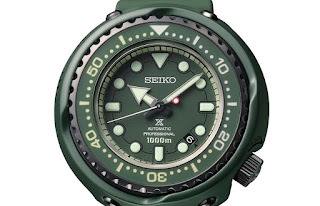 includes: H53.5mm x W52.4mm x D17.2mm cases with 1000m of water resistance, SAT diving suitable, Sapphire crystals and 26 jewel, Seiko 8L35 automatic calibers with 50hrs of power-reserve. 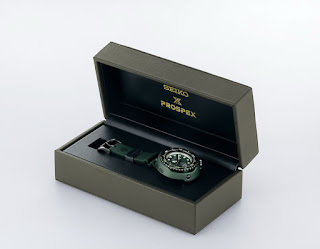 The watches are delivered in special colored leatherette presentation boxes. They have a Japanese MSRP is 400,000 JPY+TAX. Thoughts? Toyish, childish, geeky yet ultimately cool. I would never buy one but I do appreciate them and if I was ever lucky enough to wear one I’d rock the sh!t out of it. What do you think? This pitch black beauty (ref. 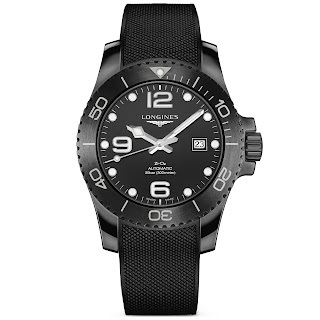 L3.784.4.56.9) is the newest member of the Longines HydroConquest family which is presented in a sleek all-black finish that has been entirely made from high-tech black ceramic. 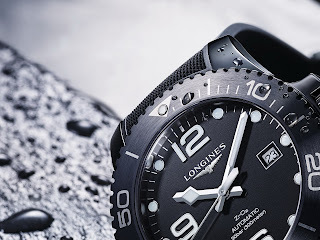 Longines has just recently updated the HydroConquest family with new colored ceramic bezel inserts but unlike those, this newest model has adopted black ceramic for the watch as a whole. 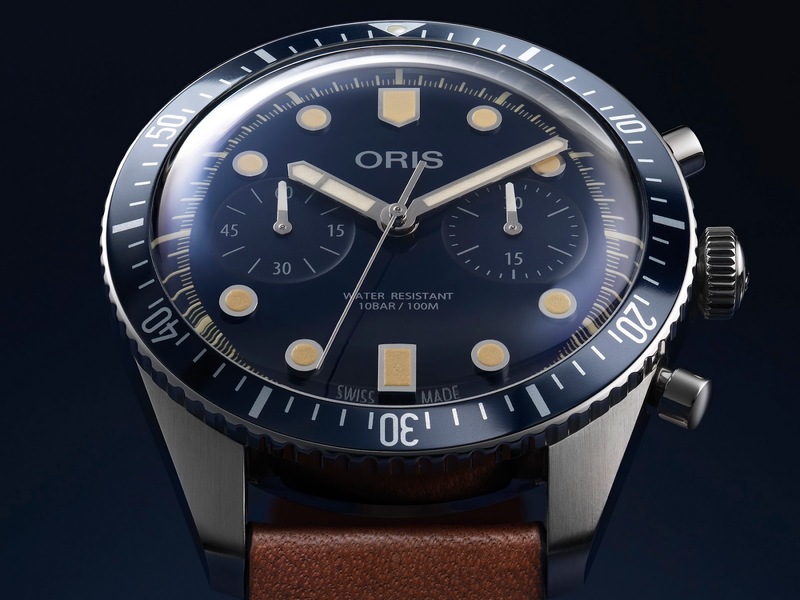 Its 42mm in diameter case as well as its components, such as its rotational diver’s bezel including inlay, the screwed-down case-back and crown; even its dial have all been made from black ceramic. 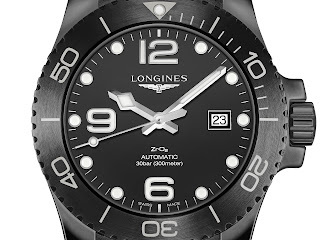 And just in case you were in any doubt of this new HydroConquest’s genetic makeup, Longines has thoughtfully included an additional line of white dial text, proudly stating the chemical number for ceramic, ZrO2. Adding a little variation and interest to an otherwise sober all-black aesthetic; Longines has given each of the watch’s components a different finish: a matte dial, a polished case, a round satin bezel and a back blending a circular satin and matte finish. 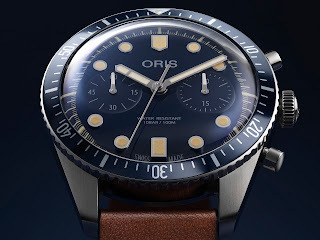 The all this blackness is however disrupted by the radiant white of the watch’s SuperLumiNova coated indexes and hands which are starkly contrasted against the deep black of the dial. 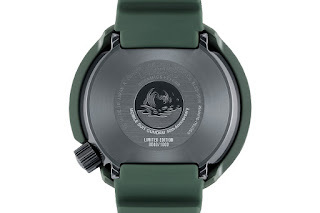 In addition to the highly scratch-resistant ceramic, diver’e features of the watch include a: a Sapphire crystal with multi-layers AR-coating on both sides, 300 meters of water resistance and a black diver’s rubber with a double security folding-clasp. 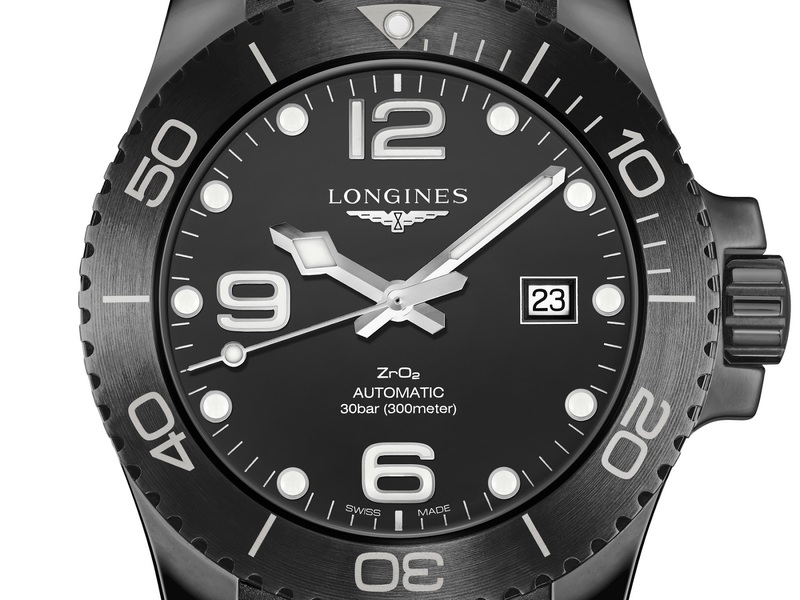 Power comes from a self-winding mechanical movement (L888.3) developed exclusively for Longines whose features include: three-hands and a calendar. 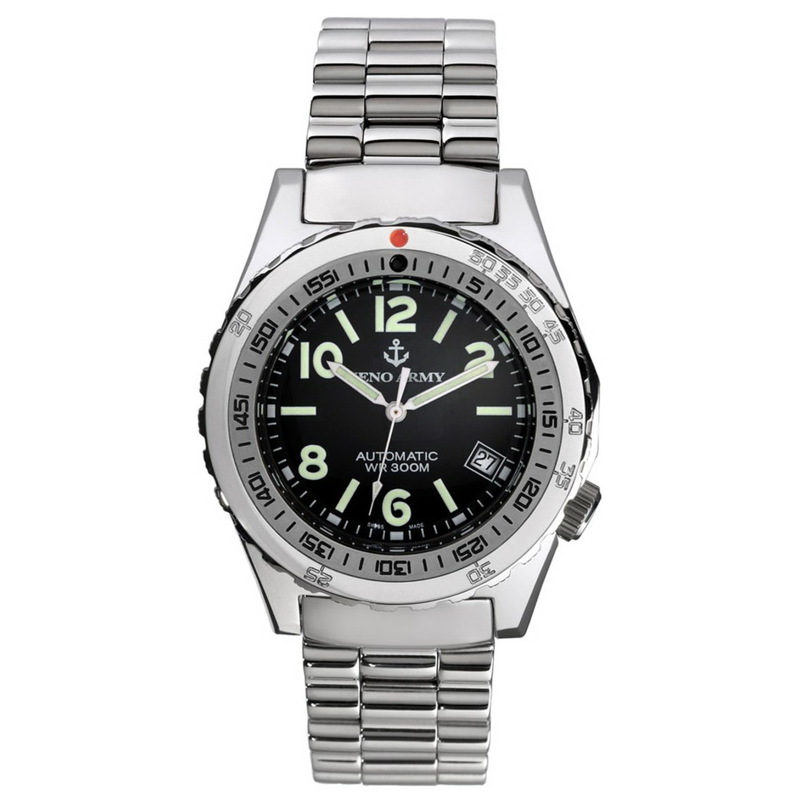 The L888.3 has 64hrs of power-reserve. 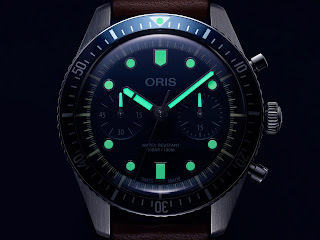 I’m far more drawn to models such as the Legend Diver or the new SKIN DIVER. Would it be too much to hope for one of those to get the ZrO2 treatment?